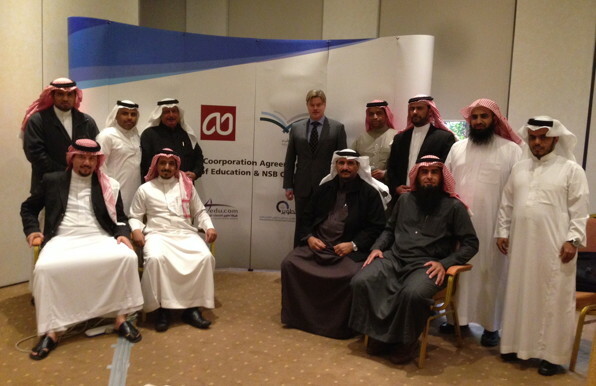 December 9, 2014 -- NSB Corporation announced today that it has signed an agreement with Tatweer Education Holding Company, part of Saudi Arabia's Ministry of Education. NSB will supply its NSB/AppStudio Education Edition for use in teaching high school students how to program. The agreement allows Tatweer to install AppStudio in all high schools in Saudi Arabia. There are some 30,000 schools in the country. Saudi High School students are required to take two terms in programming. The first term covers basic programming. The second term, using AppStudio, teaches programming for mobile devices. Approximately 450,000 students will be learning mobile device programming per year: over the 4 year life of the agreement, over 1.8 million students will learn how to program. "Students learn best when they're doing what they love." said George Henne, President of NSB Corporation. "Making their own apps for smartphones will engage them and, hopefully, hook them on programming." Training is already underway, with the first term scheduled to complete in January 2015. The Ministry developed its own curriculum in Arabic for the course. The AppStudio IDE was enhanced to provide Arabic language and right-to-left text support.